Medicine does not taste good… that’s the conclusion we inevitably make as we go through rounds and rounds of common cold and respiratory infections during childhood. After all, even that raspberry-flavored cough syrup isn’t as pleasant to take as the advertisers claim, so it’s not surprising that when it comes to eating things that supposedly benefit our health, we are somewhat reluctant. But when the medicine is actually food itself—and not just any food, but delicious food for that matter—there is no excuse to skip on those meals. If not for the sake of your palate, then definitely for the sake of your health, or in this particular case, your heart. And the good news is, all these foods are now conveniently packed in the so-called Portfolio Diet. Developed by Canadian researcher Dr. David Jenkins, the Portfolio Diet combines cholesterol-lowering foods which, when consumed daily, can lower cholesterol and blood pressure, reduce the risk of cardiovascular events, and help with blood sugar management. Nuts come packed with lots of good stuff: fiber, healthy fats, vitamins, and protein. Regular consumption of this power snack has been associated with lower levels of inflammation (linked to heart disease), lower risk of blood clot formation (a heart attack precursor), and improved artery health. If you have a nut allergy, you can substitute with pumpkin or sunflower seeds. Nuts are pretty versatile too—you can crunch them on the go, add them to salads and cereals, use them in baking and cooking, or add nut butter to dressings and dips. Don’t forget about variety: almonds, pecans, walnuts, peanuts… there are many types of nuts out there. More commonly known as soluble fiber, it helps protect against heart disease (by curbing your cholesterol) and type 2 diabetes (by slowly increasing post-meal blood sugar). For best results, make sure to have one or two servings of half a cup of cooked barley, three-quarters of a cup of steel-cut oats, or three-quarters of a cup of legumes like beans, peas, lentils, and chickpeas, three to four times a week. 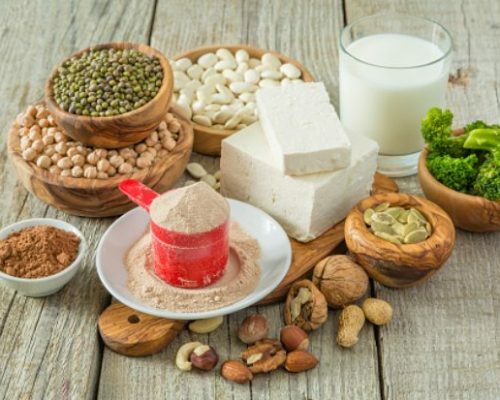 According to research, soy can help bring down blood cholesterol and blood pressure while improving artery health thanks to its high content of healthy fatty acids and protein. You can benefit from soy using it as a substitute for protein-rich foods that are high in saturated fats, like some meat cuts and high-fat dairy. In fact, studies show that 25g of soy a day can lower bad cholesterol by five to six percent. Fortified soy beverage, edamame, and extra firm tofu are all good options to try. Plant sterols have proven effective in cholesterol management by blocking cholesterol absorption, prompting the body to get rid of bad cholesterol as waste. One of the common sources of plant sterols is ground flaxseed. According to Health Canada, daily consumption of flaxseed can help lower cholesterol and benefit heart health. Ground flaxseed is very versatile, being a perfect ingredient for smoothies, cereal, muffins, and granola bars. You can stick to the Portfolio Diet even when you’re going out for a meal. Pick mainly vegetable dishes, especially items with chickpeas, lentils, or tofu. If you’re at a burger joint, try a veggie burger, and maybe a soy-based smoothie for dessert. When you’re ordering a salad, ask for dressing on the side. Lastly, skip anything deep fried or containing trans fats.